Goths Love Spring, TooOfficial TIAW Welcome! Hrm… Need less terrible ideas…. I don’t want to call angering things awesome because “awesome” brings to mind something uplifting. But anger is important and necessary to fight the things that make us angry. And that’s kind of awesome. But it bums me out and I don’t want to hear that something’s going to be awesome which leads me to expect Happy Things only to be bummed out. But I feel strongly that anger is also awesome when it’s necessary and lord knows it’s so often necessary in these issues. I. Um. May over think things. A little bit. Eventually my circle of thoughts would spin so fast, I’d go flying out and land in a pile in the corner dizzy and needing more coffee or chocolate. Or chocolate coffee. I considered divvying them up sometimes to keep them separate, but there was really no way to know if I’d get enough items each week to necessitate both. And I didn’t want to sit on them to collect enough for a post. And, really, isn’t life all messy and awkward anyway? Life isn’t divvied up all nice and neat. And I am constantly trying to remember that in my life and in the projects I do. Even so. This is my blog, and it appeals to my sense of order to have a name that suits the weekly roundup posts I do. So there. Life may be messy – and I may try to embrace it in other places – but it’s also OK to take those things I can tie up into neat little packages and tie them up into neat little packages. Therefore, I’m changing the name. 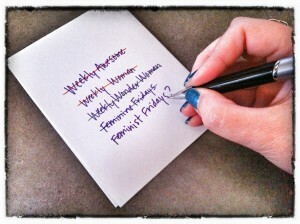 I’m overly partial to alliteration for some reason so right now I’m leaning towards Feminist Fridays, but I’m also worried that might sound a little dry. So I’m asking for your opinions. What do you think we should rename this weekly post? I’m attached to the Weekly Awesome, even though it’s imperfectly named. Maybe you can call it Imperfectly Titled Weekly Link Collection. The Weakly Labeled Weekly Links for Women List…haha! I’m kind of attached to the Weekly Awesome, too, although I can see why it bothers you. I don’t really have any real suggestions other than to say, whatever you call it, your work is appreciated. Also, best of luck in your new space! Women’s Wednesday? Are you committed to the word feminist? Or Friday? Focus on Feminism Friday then. Or maybe Weekly Women’s News. Or Feminist (Women’s) News of the Week. Or ….eh, that’s it. My name-er is all out of names. I’m not really committed to either. I was considering it because it makes sense and because it’s alliterative and I’m nerdy that way. Womanly Wednesday would work for that, too, but sounds way cornier. Heh.